A complementary gel for cellulite treatment which acts on localised adiposities, helping to eliminate the unpleasant skin condition known as “Orange Peel” and repairs cutaneous surface roughness. It oxygenates skin and prevents premature signs of skin aging and also tones, firms and moisturises the tissues. It restores the elasticity and natural look of the skin. INGREDIENTS: Slimming Liposomes with Caffeine, Carnitine, Coenzyme A and Vitamin E acetate, Hydrocotyle, Ivy and Horse Chestnut extracts, Collagen and Elastin amino acids, Vitaminised spheres with Vitamin A palmitate and E acetate. 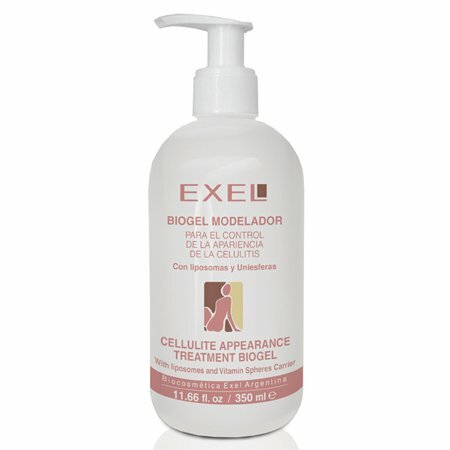 Exel Cellulite Appearance Treatment Biogel is a potent active gel that works on local adiposities for treating and diminishing the signs of cellulite. It oxygenates the skin and helps to prevent visible signs of premature aging. 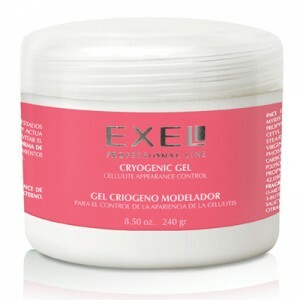 It tones, firms and moisturises the tissue while restoring elasticity. Formulated with liposomes and Vitamin microspheres, a delivery system which allows the plant based active ingredients to reach the fat cells that cause cellulite beneath the connective tissue, promoting faster results. It is best applied with a massage until completely absorbed, which allows the Biogel to activate microcirculation and relieves fluid retention. Caffeine: Reduces the fat content of the cells, increases skin permeability and increases microcirculation. Caffeine also drains excess fluid, tightens and firms the skin and acts as an anti-inflammatory agent, reducing the swelling that causes the “orange peel” appearance. L-Carnitine: An essential nutrient that is naturally produced by the body that assists the metabolism of fat. L-Carnitine decreases the availability of fatty acids in the fats cells during the lipolytic process, by transferring adipocytes (fat cells) to energy. Due to its fat burning properties L-Carnitine helps to free fat from the cells and reduces cellulite. Vitamin E: A powerful antioxidant which is essential for skin health. It neutralises free radicals and prevents skin dryness. 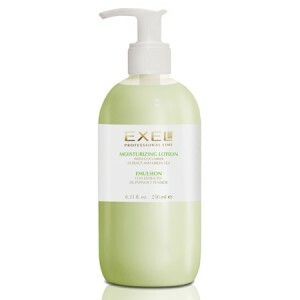 It softens and improves skin texture. Centella Asiatica: A powerful herb with skin healing properties which promotes collagen synthesis by encouraging the growth of fibroblasts. 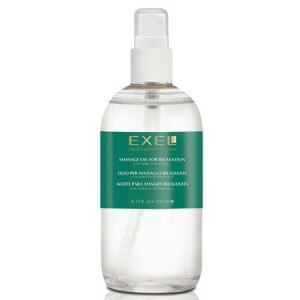 It firms and tones the skin, while diminishing and preventing the appearance of stretchmarks. English Ivy Leaf Extract: Relieves congestion in the lymphatic system, allowing toxins to be flushed from the body. It has anti-inflammatory properties and improves the dimply appearance of cellulite. Horse Chestnut Extract: to improve circulatory function and strengthen veins by nourishing and rebuilding small gaps in the venous walls.